Here is one more project I made for the Impression Obsession and Shimmerz swap. The clear stamp set I used ont his wine tag is called Hugs & Kisses. Even though these stamps are for Valentine's Cards I just had to have them. 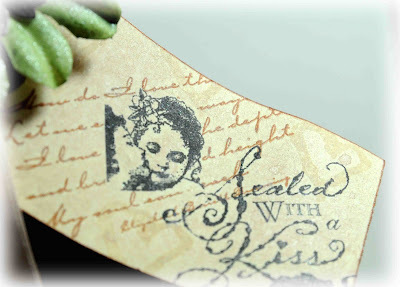 You can use the stamps seperately for love card, wedding cards, tags etc. I chose to use them on a wine tag. Here you see a close up of the flowers I used. 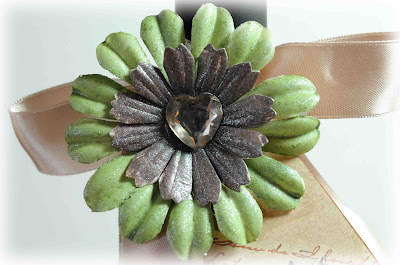 The green was painted with Shimmerz Green Olive and the brown was painted with Choc-o-lot. I masked some of the stamps together on the tag. I used black ink and some different brown inks. I sprayed the tag with Shimmerz Spritz Mudpie. You can double click the picture to see the shimmery effect on the tag. this is such a romantic tag! love it!